The red Vauxhall Cavalier cruised into the town centre and slipped into a parking place outside S. D. Kells, a draper's shop. The two men who got out could not have looked more relaxed. One of them even smiled at a woman passer-by. Then they got into another car, which had arrived just before them, and drove away. There was nothing to arouse the suspicions of the crowds milling through Omagh's Market Street. Yet packed into the Cavalier's boot was a quarter of a ton of explosives, improvised from fertiliser and sugar. A detonation timer was hidden in a plastic lunchbox in the glove compartment. When the bombers had parked, they had set the timer by adjusting a black plastic knob and two metal switches. And so the minutes began ticking down to an atrocity in which 29 people (and two unborn children) would die, hundreds would be injured and the lives of families and friends would be scarred for life. 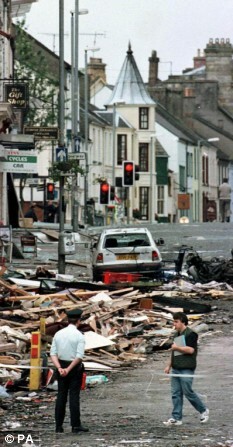 The Omagh bombing came at a time when the people of Northern Ireland had every expectation of living in peace for the first time in decades. They were in a joyful mood. The streets of the little market town were crammed with more people than usual on that sunny Saturday in August. It was the time of year when mothers and children headed to the shops to buy school uniforms. There was also to be a parade that day, with bands, floats, stilt-walkers and clowns, the climax of a week-long carnival. It was meant to be a happy family day, as one local recalled, 'of singing, dancing and barbecues'. In 1973, IRA bombs had devastated the town centre, killing five off-duty soldiers. But all that seemed in the past. The ceasefire between the Provisional IRA and the British government had been holding for more than a year and, just four months earlier, the Good Friday Agreement had paved the way towards a permanent, power-sharing deal across Northern Ireland's political and religious divide. People were revelling in a world where the town centre was no longer cordoned off, there were no helicopters overhead and no security zones or concrete 'dragon's teeth' preventing them from parking near the shops. History appeared to be leaving behind the men of violence. But their faith in a future free from terrorist attacks was about to be destroyed. At around 2.30pm, a man phoned the newsroom of Ulster Television in Belfast, giving a codeword to establish his authenticity and, in a muffled voice made even harder to understand because of his heavy accent, said a 500lb bomb was set to go off outside the courthouse in Main Street, Omagh. Two minutes later, the Samaritans received a similar call, but this time it was said that the bomb was located '200 yards up from the courthouse in High Street, the main street'. The police immediately took action. Though there is no Main Street in Omagh and the location given was vague, they took the warnings seriously. Mobile units were ordered to begin an immediate evacuation of the courthouse area. The ambiguity and imprecision of the warnings had a dreadful consequence. As the police cajoled and corralled people along Market Street, they were inadvertently steering them into danger, not away from it. The car bomb was not at the courthouse, but on the very route the crowd was being urged along. They were heading away from safety and towards disaster. Lulled into a sense of security by the IRA's ceasefire, the local people were bored with bomb hoaxes - there had been 17 in the town in the previous eight months. PC Tara McBurney had cleared the shops and was stringing a white tape from one side of the street to the other. 'I had to constantly push and shove people to keep them moving,' she said. Soon, the area around the courthouse was clear - 'like a ghost town,' as one police officer noticed. Meanwhile, nearly a quarter of a mile away, at the far end of Market Street, in the red Vauxhall at the side of the road, the timer on the quarter-ton of home-made explosives inside ticked down second by lethal second. At 3.04pm, the car bomb exploded. PC McBurney, standing in front of Spick & Span dry cleaners, felt a strong wind. 'My breath was taken away for about five seconds. Debris flew past, clipping me as it went,' she said. When she opened her eyes, she saw dead bodies and body parts littering the ground along Market Street. 'Everybody was screaming and hysterical and covered in blood,' she said. A bomb blast, as pathologist Dr Derek Carson explained to the Omagh inquest, damages people in three ways - directly by the blast wave hitting your chest and lungs, by throwing solid objects against you or throwing you against solid objects. Fred White, 60, a retired accounts clerk, and his horticulturist son Bryan, 27, took the blast full on. They had come into the town centre to shop for food after returning from holiday. 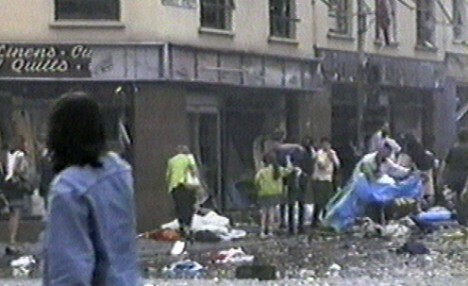 They walked out of The Salad Bowl greengrocer's on Market Street and straight into the explosion. They were the closest when the bomb went off. Fred was killed by multiple injuries, Bryan by laceration of the brain. Kevin Skelton was browsing in Mr Gees, an ornament shop, when he saw the glass window coming to meet him. 'As it shattered, I burst through the door and saw the explosion travelling down the street, bouncing off each building. One would blow in and the next one out, falling like a pack of cards,' he said. Before his eyes, the Kozy Corner pub disintegrated into rubble. He rushed next door into S. D. Kells, where moments before he had left his wife Philomena, 49, to shop for shoes. He found her 'like a rag doll, face down, the clothes blown off her back - I knew she was dead'. In the street, 21-year- old Aidan Gallagher, a car mechanic with his own business, lay dying. He was in town with a friend to buy jeans - a first for him, as his mother always bought his clothes and he'd had to ask her what size he was before he left. Shrapnel had fractured his spinal cord. A man who came to his aid noticed him move slightly and bent over him. 'He turned his head away from me, let out two big sighs and then he was gone,' he said. Many others had died in the street. Esther Gibson, 36, had driven into Omagh to buy flowers to decorate the church where she was a Sunday school teacher. She was killed instantly by shrapnel that shattered her skull. Through the acrid, black smoke that enveloped Market Street, Police Sgt Peter Salter could see 200 people. 'The majority of them injured, some lying on the ground, some walking towards me with injuries that ranged from shock and lacerations to severe head, chest, stomach and limb injuries. Of those lying on the road, some were obviously dead,' he said. The blast had torn down buildings, cut phone and electricity power lines, created a 3m wide crater in the road and fractured a water main. Bloody water was flowing down the street. 'In the roadway were large amounts of belongings including handbags, shoes, clothing and prams, as well as body parts,' said Sgt Salter. And everywhere there were desperate people scrabbling in the rubble searching for relatives and friends. Another police officer found himself reeling from 'the dreadful smell of burning flesh and blood' - a stench that would hang over Omagh for a long time. Sgt Philip Marshall took charge, moving from person to person, making hard decisions as he established priorities for treatment. He had to ignore some victims begging for help 'because if they were able to talk, they were not as bad as the person lying a couple of feet away'. He tried 'to switch off as a human being, because I needed to remain level headed'. But he almost lost control at the sight of a baby's body in the window of a greengrocer's. For a moment, he thought it was his own daughter. He co-opted uninjured members of the public - some of them very young - to help, assigning two to each of the most severe casualties: one to administer first aid as best they could; the other to whisper words of comfort. Robert Bonar, who fetched first aid kits from Boots, where he worked, recalled a teenager of about 14, sitting on the ground among the dirt and grime, holding the hand of a dead girl, whom he presumed was her friend. At every turn, there were unimaginable horrors. PC Tara McBurney rushed to help a girl who was screaming and pointing to another one with 'a piece of mangled and twisted metal about five inches long protruding from her chest'. The PC escorted casualties to her police car and began ferrying them the half-mile to Tyrone County Hospital. 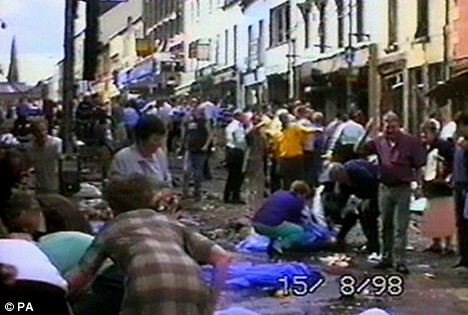 One of the first to arrive there was 20-month- old Breda Devine, who was being wheeled across Market Street in her buggy when the bomb went off. Her uncle, Garry McGillion, was thrown into the air and knocked out by the blast. He came round to discover he was on fire. He tore off his burning shirt as he looked round frantically for his niece. He found her under rubble and a shop sign, in the buggy which his unconscious fiancee, Donna Marie Keys, was still holding. The couple were to be married the following week and had come into town to buy shoes for Breda, who was to be their bridesmaid. Garry ran with Breda to a policeman, who thrust her into the arms of another casualty heading for the hospital in a commandeered car. Burned and with many injuries, including a skull fracture and swelling of the brain, Breda was pronounced dead at 3.50pm. Twelve-year- old James Barker was another of the child victims. As he lay in the road, two passers-by cradled his head before a Land Rover took him to hospital. Doctors tried to stem the massive blood loss from an abdominal wound, but James died on the operating table. He shouldn't have been in Omagh anyway. English-born and wearing a white Three Lions football shirt, he lived in the Republic of Ireland, went to school in Londonderry and was with a coach-load of youngsters who had visited a nearby theme park and had stopped off in the town on a whim to do some shopping. The hospital resembled a battlefield as crowds of bleeding, broken people staggered through the doors, and doctors, nurses and paramedics struggled to deal with the emergency. Consultant surgeon Dominic Pinto had heard the blast at home and made his way to the hospital, where he found pandemonium. 'A&E was full, there were people lying in the corridor and overflowing into Radiology, with more arriving all the time. We had 240 injured people within the first 45 minutes. This was not a major incident, but a major disaster,' he said. Geraldine Breslin, a 43-year-old assistant in Watterson's, the other draper's shop on Market Street, was brought into Casualty. When the shop had been evacuated by the police, she had gone out into the street with her fellow shop assistant, Ann McCombe, 48. Though Geraldine was a nonpractising Catholic and Ann a church-going Protestant, they were best friends. The pair had been sunning themselves, waiting for the bomb alert to be over so they could go back to work, when the bomb went off. Geraldine was operated on to stem internal bleeding, but she died from multiple injuries - eight fractured ribs, shrapnel in her skull and a lacerated liver. Ann was found later, under the rubble of fallen beams in S. D. Kells, into which she had been blown by the blast. She had died instantly from a piece of jagged shrapnel that had torn through her face, jaw and neck. Her body was on top of an almost headless corpse. 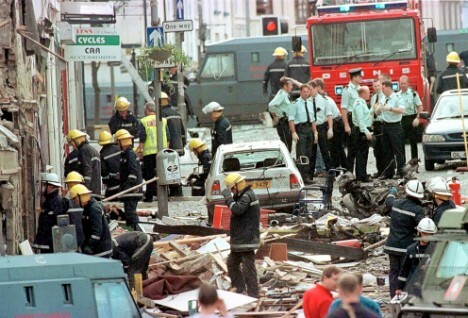 In Omagh's streets, desperate battles were going on everywhere to save lives, and there was heroism and humanity in the midst of horror as ordinary people worked alongside the police. When the debris stopped falling around him, PC Colin Doherty saw the flailing arms of a woman trapped under the burning axle and wheels of a car. 'I held on to her arm as other people tried to push the axle off her. Her legs were on fire and a man took off his coat and wrapped them in it,' he said. Cllr Paddy McGowan, a volunteer fireman, was on the scene within three minutes of the bomb going off. He organised people to take shelves and doors from shops for stretchers and duvets to cover the dead, and flagged down buses to take victims to hospital. So terrible were the injuries, he said later, 'that the blood was flowing down the bus steps and out on to the road. When it was over, all the seats had to be destroyed'. One of the bus drivers recalled the screams of pain when he drove over the speed bumps at the hospital. Still the casualties piled up - and the death count. Seventeen-year-old Samantha McFarland, an A-level student who wanted to go backpacking round the world, was spending her Saturday as a volunteer in the Oxfam shop, and had closed up when the police cleared the area. She was found in the street after the blast and was declared dead on arrival at hospital, from multiple fractures and a broken skull. Her best friend, Lorraine Wilson, 15, who had also been working in the shop, bled to death through a holed artery. Many of the injured refused treatment so they could stay and help those in a worse state. PC Alan Palmer went on searching for survivors under rubble and giving first aid to the injured, unaware that his back had been lacerated by flying glass and he was bleeding copiously. He needed 27 stitches. Sgt Philip Marshall lined up his officers across Market Street for a systematic search. As burglar alarms shrieked and people screamed and sobbed, they advanced grimly, sifting through the charnel house the centre of Omagh had become, their uniforms caked with grime and blood. Some of the police were crying. Sgt Peter Salter found 57-year-old Elizabeth 'Libby' Rush lying where she had been blown backwards into the Pine Emporium, the furniture shop she owned and ran. She had been facing the bomb and would have died quickly from lacerations of the lung, liver, diaphragm and ribcage. Inspector Billy Williams was searching buildings, all the while terrified that his daughter was missing. He had come across his son-in-law looking for her. At one stage, he saw a pair of multicoloured glasses in the street he thought were hers. To his relief, she appeared at the police cordon. All the doctors were at the hospital, but Sgt Marshall desperately needed one to pronounce deaths, so the bodies could be moved to somewhere private. Preserving their dignity, he knew, was of the utmost importance, particularly with the media descending on the scene. Army doctor Captain Sam Potter arrived from the nearby barracks and made a systematic examination of 20 bodies, pronouncing life extinct. They were covered with curtains, blankets, towels, sheets or any other coverings taken from the shops, and then carried to a roped-off alleyway. The sights witnessed that day were horrendous and the long-term effect on the policemen was immense. Years later, I met an officer who had been in the control room and could not speak of what he had heard without dissolving into tears. 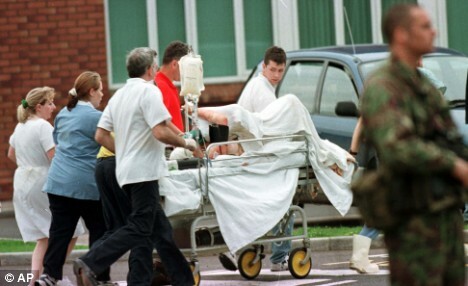 Some of the officers who had been on the streets of Omagh that day were never able to return to a normal life and were invalided out of the police force. One was so traumatised that he killed himself, but laid himself out in a body bag before putting the gun to his head because he didn't want anyone to have to deal with the aftermath. Sgt Marshall had two years of therapy, but it was three-and-a-half years before he could walk into Market Street without being physically sick. 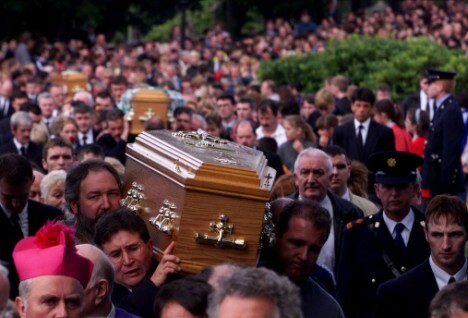 But the most terrible aftermath of Omagh was - as we will see on Monday - the anguish of the families of the 29 men, women and children who lost their lives that terrible day. This is an abridged extract from Aftermath by Ruth Dudley Edwards, to be published by Harvill Secker on July 2 at £12.99. ° 2009 Ruth Dudley Edwards. To order this book P&P free, tel: 0845 155 0720.